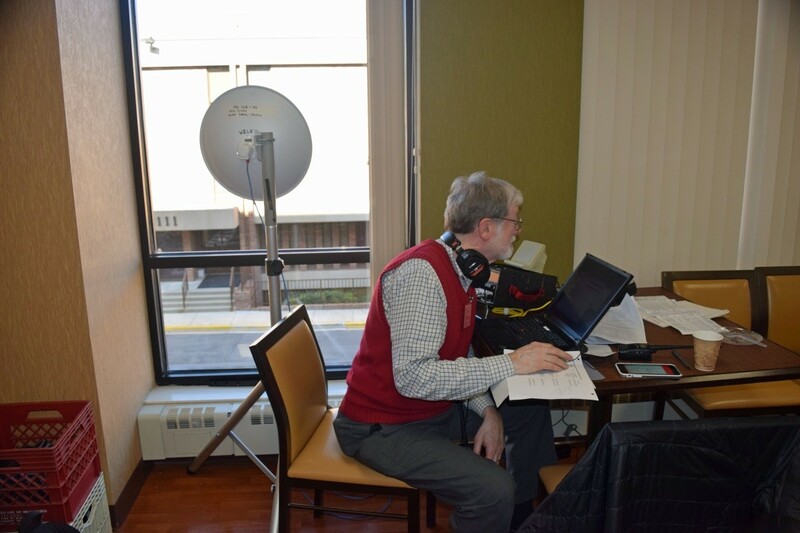 Because the EOC at at one of our local hospitals has no convenient access to the roof or the great outdoors, we chose to test a new concept for a portable VHF/UHF station that we have developed for just this type of situation. This consists of a Kenwood TM-D710 dual-band radio with its front panel separated from the radio body via a pair of RemoteRig interface units. The RemoteRig units are designed to be able to remotely operate a radio over a local area network or the Internet. They can be configured to work with many modern Amateur Radios, including the TM-D710. In most cases, the radio operates with full functionality when operated remotely. Our hosts were not thrilled with the idea of running even a single CAT-5 cable through the hallways and stairwells of the hospital. 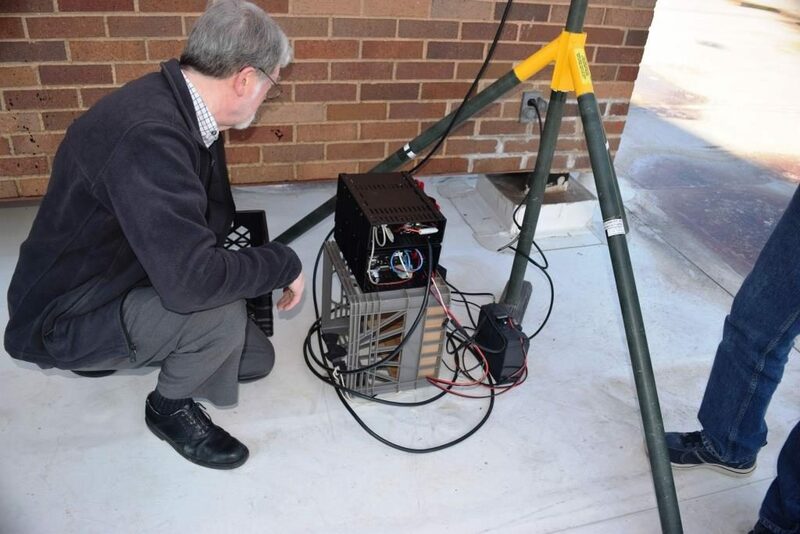 So, in another interesting twist, we installed the TM-D710 on the roof of an adjacent office building, and used a broadband microwave link to make the connection to its control head inside the “landlocked” EOC. On another occasion, we installed the TM-D710 in the MAIPN van, parked in a distant corner of the hospital parking lot. 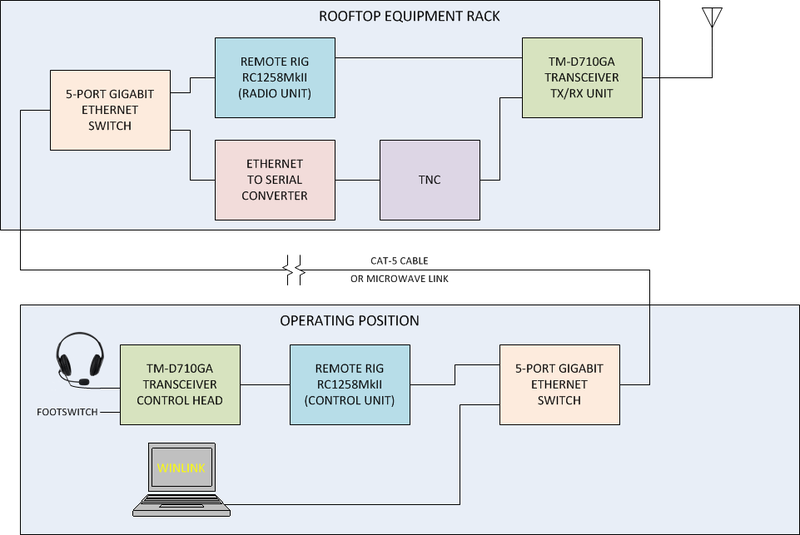 With this setup, an operator in the EOC could participate in a 70 cm voice net while simultaneously passing Winlink traffic on 2 m.
In our implementation, the provision of an inexpensive ($15) Ethernet switch at either end of the link permits the radio to be operated over the microwave link. Click on the following image to see the block diagram full-size. At the operating position the control unit integrates the radio’s control head, the RemoteRig interface unit, and a 5-port Ethernet switch, all mounted in an enclosure with a single 12V power input connector. All of this equipment combined draws less than 2 amperes at 12 VDC, and is powered by a small 12 V external power supply or a 12V battery. Rear view of RemoteRig system at operating position. The aluminum enclosure on top of the Ethernet switch contains a 12V-to-5V regulator that supplies power to the network switch. The yellow CAT-5 cable goes to the laptop and provides the laptop’s connection to the remote TNC. The blue CAT-5 cable supplies power and an Ethernet connection to the microwave radio. A small speaker is attached to the top of the enclosure. 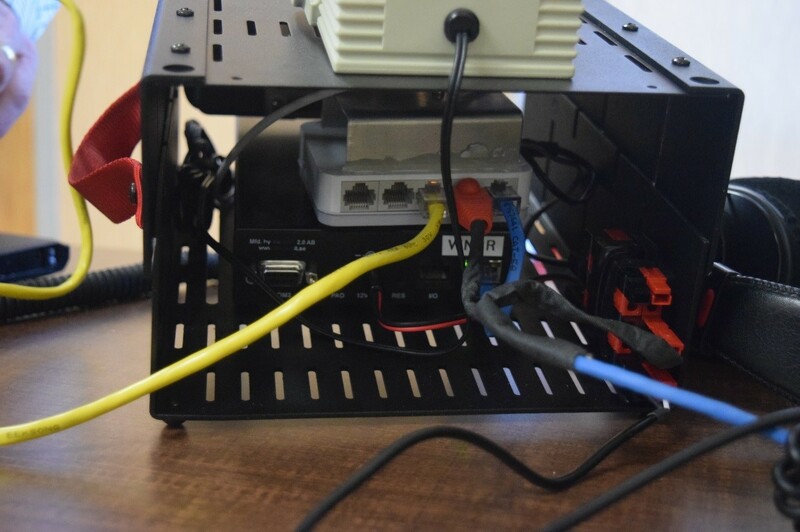 A second enclosure houses the radio body, the companion RemoteRig unit, a TNC, and Ethernet-to-serial converter (for the TNC), and another 5-port Ethernet switch. View of the operating position in the Hospital EOC. One one occasion, the companion unit was set up on the roof of the building visible outside the window. On another occasion, we set up the companion unit in the MAIPN van, which was parked behind the adjacent building. 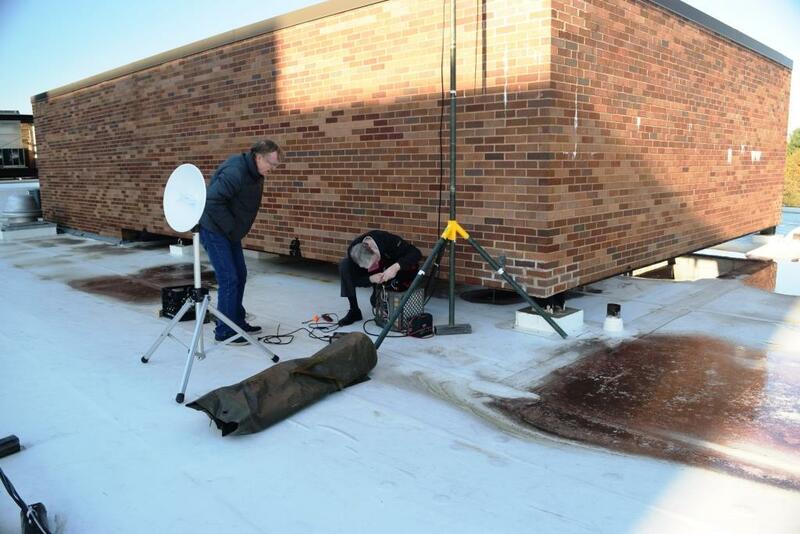 Keith, KC3TCB, looks on as Al, KN3U hooks up the radio on a chilly rooftop. The large tripod mast supports a dual-band antenna. Installing the radio in the MAIPN van was easy by comparison. View of the radio installation on the rooftop. the black enclosure houses the radio, RemoteRig unit, and TNC. The equipment is powered by a 12V battery. A battery charger keeps the battery topped off as long as AC power is available.